Bill Bowles was Chief Quatermaster on the USS Daly from 1953 to 1955, although having spent many years in the service this was his first Equator Crossing. 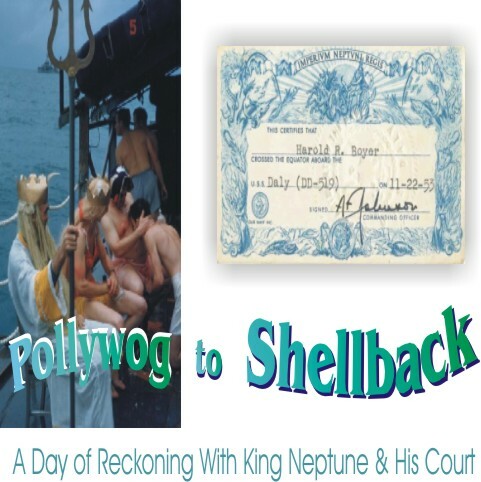 He and many other Polywogs, a name given to those who had not yet experienced the process of initiation, elected to change his status from Pollywog to Shellback. 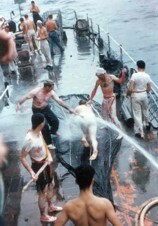 This is a well established ritual initiation that has long been a tradition of sailors of the fleet who have crossed the Equator. It was to be an experience that would remain etched in his memory forever. 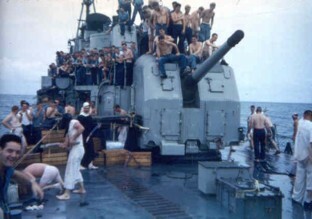 Shellbacks, ( those sailors who had already experienced the initiation). As a Polwog, I was ordered by a written directive, to wear a white jumper turned inside out, a white hat on the back of my head, and a pair of cut-off dungarees. I was then assigned a position on the bow of the ship, which was underway, to be on the lookout for King Neptune. About a half hour later I was approached by a Master-at-Arms, who said I was out of uniform. He ordered me to follow him aft. At the quarterdeck I was accused of several other things and then directed to start through the various stages of initiation. Thus I bacame a Shellback, but unfortunately I never had the opportunity to reciprocate on someone else. However, the sickening smell and taste of "The Royal Belly" remains with me to this day. Hal Boyer GM3 was also involved in the initiation on this day. I was summoned early and given a directive to report to the bow of the ship as "Ship's Artist" and assigned the task of creating a mural of the day's activities. My attire for the day included a Japanese Robe; a watch hat, dark glasses and sandals with a GI can lid as a palette and a brush. As I began painting I was immediately criticized for not using more vivid colors. My paint pail was filled with sea water. It was not long before I was approached by the Master-At -Arms and escorted to the Quarterdeck. As all pollywogs I was read the charges of my inability of not carrying out my courtly duties. To mend my crimes I had to bow to the Royal Court and was ordered to my knees before the Royal Baby. I too had a taste of that "awful" mess of a concoction, as I kissed the belly. From there I do remember the crawling, no running was allowed, as the deck was wet and slippery. I was hosed down and swatted from behind as I made my way to the Royal Barber where I experienced an obnoxious hair rinse and a gentle trim, my beard was snipped. From there I recall a plunge in a tub of salt water made from a canvas draped over some sort of support. Wet, smelly but physically unscathed I made my way forward and was permitted acceptance into the Royal Family of Neptune. My official card, signed by our skipper appears at the head of this column. It was a great experience. Unfortunately I never had the opportunity to do another crossing.